Mumbai Indians have lost another overseas fast bowler as Adam Milne of New Zealand pulled out of the 12th edition of the Indian Premier League (IPL) due to a swollen heel. It will be a battle of equals when Delhi Capitals host Mumbai Indians in their Indian Premier League encounter at the Feroze Shah Kotla stadium on Thursday.Both teams are coming into the game having..
Mumbai Indians skipper Rohit Sharma has showered praise on Lasith Malinga, saying that they missed the Sri Lankan fast bowler in their previous matches of the ongoing edition of the Indian Premier.. 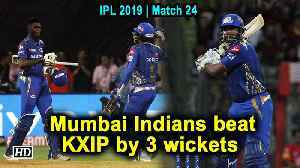 Despite a slow start, it was Hardik Pandya and Keiron Pollard's quick-fire play, which propelled Mumbai Indians to 170/5 in an Indian Premier League (IPL) match with Chennai Super Kings at the Wankhede.. In a match going down the wire, an unlucky Royals Challengers Bangalore lost a thrilling Indian Premier League (IPL) contest to Mumbai Indians by just six runs despite a labourious effort by AB de..